Around two months ago, a new caller location system was implemented in New Zealand for 111 (the emergency calling number) mobile phone calls, in order to automatically provide emergency services with the probable location of a caller. The system is a collaboration between the Ministry of Business, Innovation and Employment (MBIE), Emergency Service Providers (New Zealand Police, New Zealand Fire Service, St John and Wellington Free Ambulance) and Mobile Network Operators (Spark, 2degrees and Vodafone). Each year, there are more than two million calls to emergency services. In 2016, more than 80 per cent of calls to 111 were made from a mobile phone. Emergency callers are required to state their address or location to the 111 operator as a first priority. While the new system does not replace this need, it is expected to improve public safety and potentially save lives, by decreasing the time taken to accept and verify the location of 111 mobile callers, and by reducing the average dispatch time for emergency events from mobile phones. Previously, emergency services experienced difficulties in pinpointing a caller’s location where people weren’t able to give an accurate address. In some cases (1,800 incidents during 2016) they had to make a special information request to a network provider for a caller’s location. 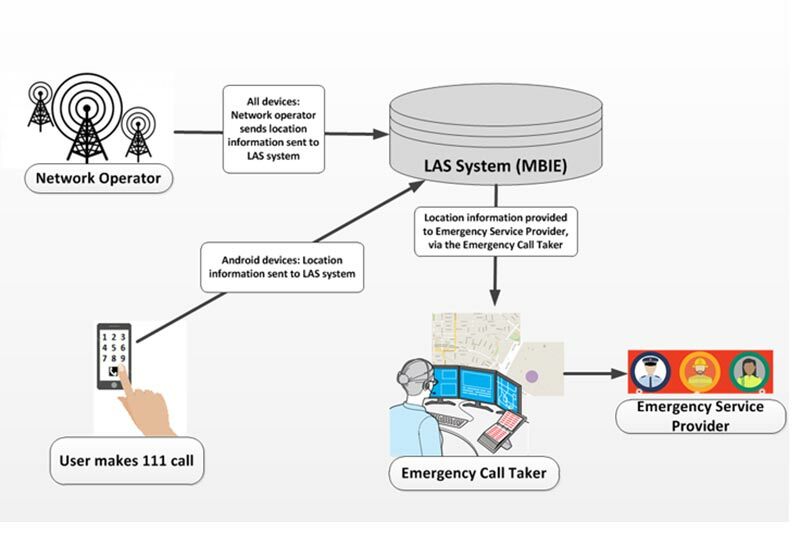 The Emergency Caller Location Information (ECLI) system provides 111 emergency call takers with automatically generated information about the likely location of a caller when a 111 call is made from a mobile phone on the cellular network. It is similar to systems already in place in the United States, the United Kingdom and Europe. This location information is provided to the emergency call taker via the Location Area Service (LAS) system operated by the MBIE. The system uses two kinds of data. The first is low precision location data based on the cell tower through which the call is connected from mobile network operators. This data is available for all mobile devices, even if the handset’s location services are switched off. For Android smartphones, which make up approximately 70 per cent of the New Zealand smartphone market, high precision location data is provided by Google’s Android Emergency Location service, which uses GPS, Wi-Fi or cell site information to define the location of the handset. If a person is dialling 111 from an Android phone, the handset automatically turns on location services when the 111 call is made, so that the LAS system can receive the location data and pass it on to the appropriate Emergency Service Provider. The location services on the phone return to their previous state once the 111 call ends and the location data is sent. New Zealand is the first country outside of Europe to go live with Google’s Android Emergency Location service nationally. According to a press release, the system is already having significant impact. Since the system was introduced, operators used it to obtain more accurate information about a caller’s location in around 20 per cent of 145,000 genuine 111 calls. Ten examples were shared in the release, where timely response enabled by the location detection system made a big difference. For instance, NZ Police received a 111 ‘hang-up’ call from a distressed woman, who had been involved in a family harm incident. The call was disconnected before she could provide her location. Using the system, Police were able to identify her location and respond accordingly. In another case, Wellington Free Ambulance received a call from a man who had woken up on the side of the road, with no idea where he was or what had happened. He had a history of seizures, and had been driving. The only details he could provide about his location was that he was in a farmland area and that there were no houses or road signs. Wellington Free Ambulance used the system to identify the man’s location and to get him the help he needed. The Caller Location Information is only provided to the Emergency Service Providers at the time of a 111 call and is only used to assist in responding to a call by verifying the location of a 111 caller. The information is only kept as part of the record of that call. It is not possible for Emergency Service Providers to use the ECLI system to find mobile devices (and their owners) when a 111 call has not been made. There is a secondary purpose of allowing the Service Providers to maintain records of the ECLI used or assisting MBIE to monitor and audit the LAS system. The boundaries and controls on the use of the system are defined by an amendment to the Telecommunications Information Privacy Code 2003. The LAS system will only hold location data for 60 minutes, after which it will be automatically deleted. The dispatch systems used by the Emergency Service Providers include Emergency Caller Location Information data as part of the record of the call. Those records will be retained by the Emergency Service Providers, for the period defined by the Providers’ standard data retention policies.